I bought a fig tree at a local market several years ago. Each year it died back, but re-emerged each spring., I know now that It did not get enough sunlight where it was. Two year ago I moved and replanted the bush in a sunnier spot. Last year it grew to about two feet with two separate stalks. I have never protected it from winter weather. This year it sent up three stalks of about six feet tall, and for the first time is bearing fruit. My problem is that the fruit is green and they don't appear to be growing any larger over the last month. Based on pictures shown on your blog, I'm assuming mine are the brown turkey variety. How will I know when they are ripe, and is there any reason they seem to have stopped growing? Normally a tree will put on small, hard and green figs. They usually stay that way for up to 90 days before they finally swell up, change color and ripen. The small piece of stem between the fig and the main stalk will become soft and the fig will droop down and also become soft. That is when they are ripe. Usually the lower ones on the stalk ripen first and then upwards. Dying all the way back to the ground every year is hard on the tree and makes it later to put on figs. Normally a brown turkey would have ripened its fruit by now. If you could put a ring of fencing around it, fill it with dry leaves, hay, wheat straw or anything to insulate it and put a cover of some sort over the top to keep the rain off of it will possibly save the main stalks at least so it doesn't have to start over. Some protection is needed for most varieties until they get a good woody bark on the main trunk, then they are somewhat better suited to the cold. I will attach a picture of my outdoor brown turkey from last winter. Just a few of the tender branch tips died but the rest stayed good. 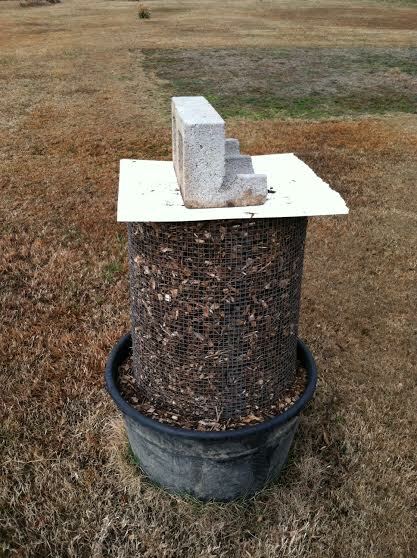 I had the wire column filled with dry wood chips and covered with a piece of styrofoam. Unless we have a mild Winter, chances are very good, we will need to provide some sort of protection for any variety of Fig we try to grow for the first few years, until they develop a hard, woody bark on a substantial main trunk or multiple trunks. The trees I have personally seen which suffered Winter die-back but survived to the main(s) had at least 2.5 inches diameter on the main(s) and woody bark. Most usually it is the year's growth for that year which will suffer and especially the tips which have not yet hardened off and are tender green when the cold weather hits. Hardening off of the stems is called lignification or to lignify or become lignified. You can observe this as the stems change from green to brown from the bottom up as the year and growth progresses. Any stem which has not yet lignified when cold weather comes is sure to be winter killed in freezing temperatures. This is what helps make some Fig varieties more cold hardy than others, the speed by which they lignify. We need to be careful with what we choose to protect our Figs with. It needs to be breathable to some degree to prohibit moisture from being trapped in with the Fig wood or it will likely mold. I learned that the hard way by making an airtight styrofoam box for some of my garage kept figs last Winter. I noticed mold forming just in time to save most of them but some were already too far gone and it didn't take long for it to happen. Dormant Figs will survive well enough in a garage if it is attached to the house and the temperatures stay right around or above freezing. Last Winter we saw low teens F and most of my potted Figs survived if temperature had been their only deciding factor. I have never seen freezing water in jugs kept in my garage. Buildings not attached to a home might need some form of heat, if just enough to keep it above freezing. Now is when the talk of winterizing Fig trees will become fairly common on the fig forums, links in the right column. They also have search functions to use and typing in 'winterizing" or "over-wintering" will show one plenty of discussions on the subject. There have been a few trees posted about on this blog which are very large and have not ever been winterized much if any at all. My only explanation for that is,they must have been started when we had mild winters, survived and developed substantial trunk(s) before any substantial cold. Them having survived the Polar Vortex of a couple Winters ago and last year is testament to their hardiness.